Karen Donde loves teaching weaving nearly as much as she does weaving. She has been teaching beginners and experienced weavers since 2006, the past nine years in Asheville. 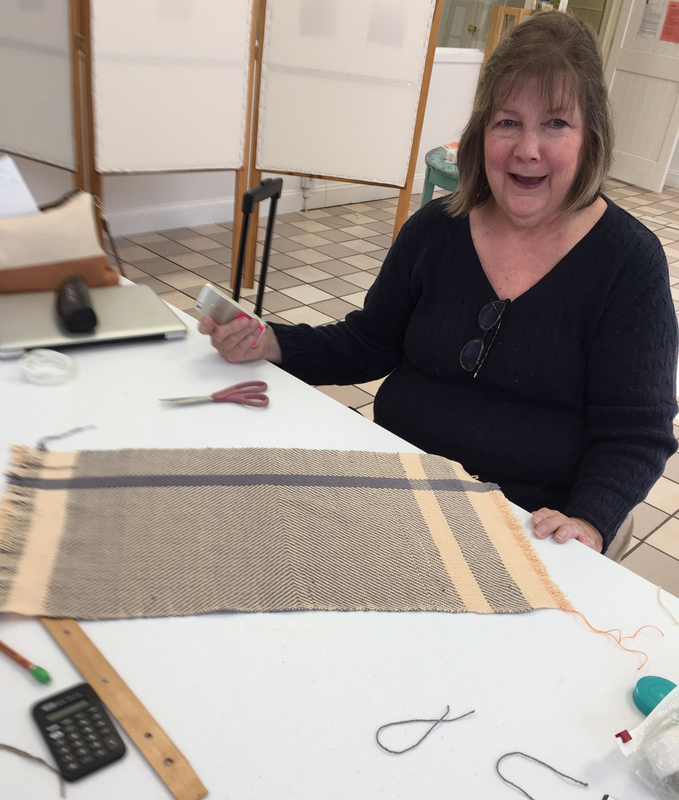 She also teaches for guilds and conferences around the US, including HGA’s Convergence in 2012, 2014 and 2016, Mid-Atlantic Fiber Association’s Workshop Weekend, Southeast Fiber Forum and Florida Tropical Weavers Conference. 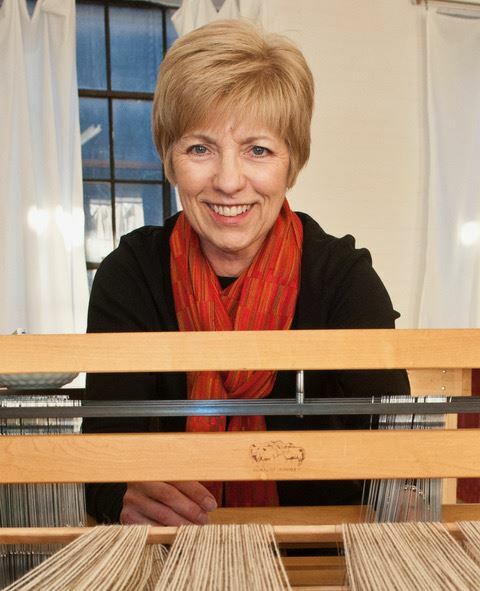 Fascinated by complex weave structures, Karen’s current loom of choice is a 32-shaft compudobby. She designs and weaves cloth for garments, accessories and home textiles for exhibit, sale and on commission. Understanding how yarns of various colors, fiber and textures interlace to create pattern is a source of perpetual inspiration, and her design experiments—at least the ones that work—often become classes or workshops to share with others. Karen used to identify as a writer, who weaves. She holds a bachelor of journalism degree from the University of Missouri and worked for newspapers, magazines and in public relations for many years. 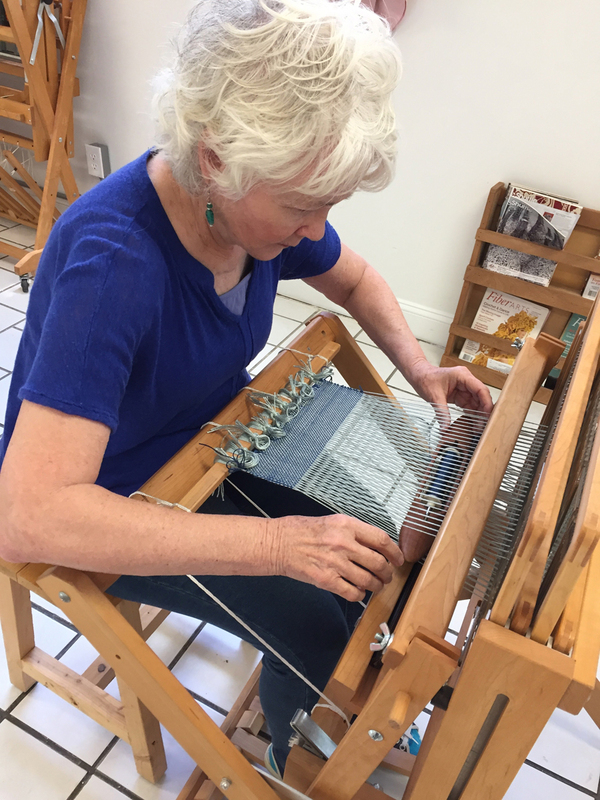 She still writes for and about weavers, but now realizes that she is really a weaver…who writes. Karen earned a Certificate of Excellence in Handweaving from the Handweavers Guild of America in 2008, became a juried member of the Southern Highland Craft Guild in 2012 and graduated from Haywood Community College’s Professional Crafts-Fiber Program in 2013. But she was taught to weave by members of the South Jersey Guild of Spinners and Handweavers, starting in 1999. It only took 4 throws of the shuttle, with her beloved weaving mentor Naomi at her side, to become hooked. After studying in Naomi’s cellar for about a year, she was invited to join a Thursday class taught by Naomi’s weaving mentor, Doris. That class, aka “therapy,” included about a dozen other South Jersey weavers, all learning at their own pace while supporting each other. This nurturing, cooperative and fun environment is what Karen hopes to emulate as a Resident Artist for Local Cloth. She’s even there on Thursdays, a bit of a full-circle moment for her. Whether you are an experienced weaver working to perfect your skills, a weaving novice ready for the next step, or someone who has never woven a pick but would like to give it a try, contact Karen to discuss what you would like to learn. She will do her best to keep you moving forward in your weaving journey. Fair warning, though…it is addicting. For a list of subjects Karen teaches regularly, please visit her website and click the Classes tab. Or if you'd like to learn something not listed, just ask and she may be able to create a class for you. Classes are non-refundable. Contact Karen to schedule. Project Handmade awarding winning collaboration with knitter Cara May. Local Alpaca & wool skirt with local buckskin panels. Local alpaca sweater by Cara. Still Life for Anni: Award winning collaboration with weavers Barb Butler and Kathie Roig. Wall hanging by Kathie, Throw by Barb, Upholstery by Karen. Rug by all three! Red Mobius. Turned Beiderwand with mixed warp. One of my favorites. It sold quickly. Monk's Belt Peplum Dress. Collaboration with designer/sewist Susan Stowell. Monk's belt weave. Roman's Holiday. Project Handmade collaboration with Susan Stowell, designer/sewist. Local alpaca mixed with other fibers. Jacket-Turned Beiderwand. Skirt-Turned twill. A Weaving 1 student with the twill towel 3 she designed herself. 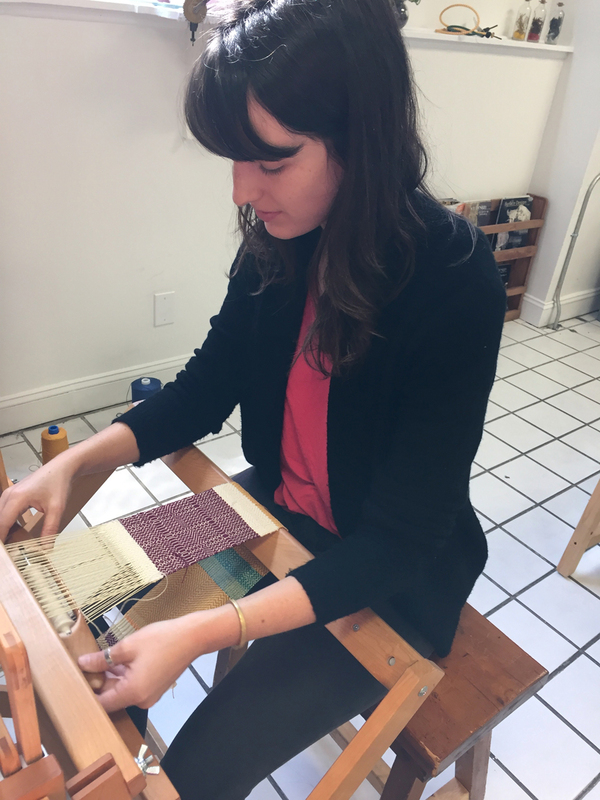 This Weaving 1 student experimented with a sample warp after finishing all three towels.